Everyone may hear about texting and driving and the bad accidents that have happened, but taking it seriously is another story entirely. Talk to your teen about distracted driving and their cell phone. With the days of Instagram and Snapchat, it is not just texting we have to worry about. Maybe have a rule that their cell phone needs to be in the backseat, or powered off, while they are behind the wheel. Most importantly, set the example by not being on your phone while driving as well. While all automotive laws are important, make sure that your teen knows speed limits are there for a reason. Besides your insurance already being expensive and a speeding ticket making it even worse, accidents do happen and often speed is a factor. Teens can cut down the chance of an accident by simply obeying the speed limit. 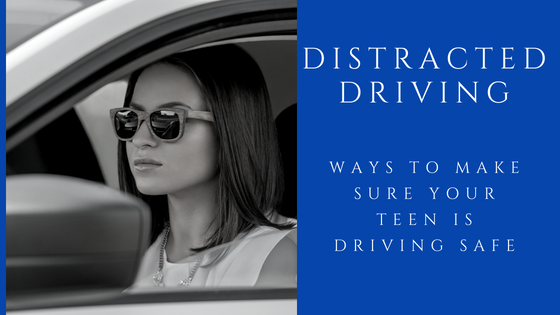 While it will be tempting for your teen to drive their friends all over the place, it may be a good idea to have set rules for this situation. It would be best to always drive alone, but this may not be a realistic expectation, especially if they have siblings. Keeping to just one other person can hugely minimize distractions. iPhone DND – If your teen has an Apple iPhone you can change their settings to silence alerts from texts while they are driving and automatically send a text to the sender letting them know they are unavailable. AT&T Drive Mode – If you are with cell carrier AT&T, this available application turns on when the car is driving and even alerts parents when it has been activated. It is similar to the iPhone DND. Canary – Getting a little more detailed, this app will actually let you know if they exceed the speed limit. Another cool feature is you can set a curfew, and it will let you know if they break it. Drive Alive – Your teen will love this app as it allows them to earn points for cash or discounts by driving safely. Hyundai Blue Link – A very good way to ensure your teen is driving safely is to actually control it. This option, on Hyundai’s, allows you to control the speed limit and curfew of your teens driving. Practice driving with your teen often to make sure they are driving safely. Talking about all of the above points on a regular basis will make sure they have these rules in the front of their mind. Always be open to talking to your teen about driving and the risks associated with it and try your best not to stress too much; they are growing up after all.